First off - the game looks great. The cell shaded graphics with the hand drawn backgrounds really puts you in the game. I will always love the classic look of the original Mega Man games but this feels like a natural next step for the series. Mega Man 7 was almost too big and Mega Man 8 felt a little flashy, but Mega Man 11 gets it just right. There were times in the levels where I would stop and just admire the little things in the background like Dr. Wily’s Fortress rotating a little every time you moved to a different screen to give the feeling that you’re circling the fortress trying to find a way in. 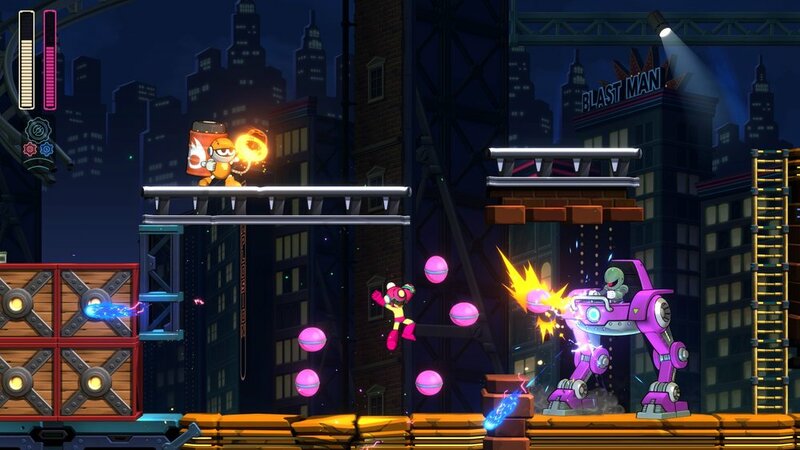 The hand drawn backgrounds in Mega Man 11 help to set the stage for the robot masters and really make the foregrounds pop! The level design is solid; there are instances when they feel a bit long (and they are), but I believe that’s by design. If the levels were as short as some of the classic games, the game would be over almost too quickly. It also adds stakes to each section of the level. Losing a life in this game hurts because it puts you one step closer to getting knocked back all the way to the beginning of the stage. Maybe I just appreciate this a lot more after playing the latter half of the Mega Man X series, where the check points were made up and the deaths didn’t matter. The mechanics of the game are very well done - though they are not very forgiving to those who aren’t taking full advantage of their resources. There are a lot of parts that you can purchase for Mega Man on the stage select screen, which will make traversing the game a little easier. For example: Every Mega Man game has some sort of knockback when you take damage. Some games are more severe than others, especially in the air. When you’re hit by an enemy in Mega Man 11, you are knocked in the opposite direction pretty abruptly and stunned. If you’re in the air, you pretty much drop straight down. This is rough in some of the later levels (especially Wily Fortress 1). The new mechanic introduced in Mega Man 11 is the double gear system. You can boost your power or slow down time giving you a chance to react to fast moving enemies by pressing L or R respectively. This isn’t as obtrusive as many of the new mechanics typically are in the Mega Man series. You can choose to use it or not - though the game is definitely made easier by using it! There were many times when I was stuck on a certain part of a level - dying over and over again - only to remember "I can slow down time to help me get through this!” though that never stopped me from trying to do it without the double gear system. The controls of the game are where it really shines. Mega Man 11 corrects the what Mega Man 9 and 10 did to add a challenge by letting you slide again. This game handles more like Mega Man 3 (which is probably why I enjoy it as much as I do!). Rush Coil and Rush Jet are now one button inputs instead of selecting a different load out. You can access Rush Coil or Jet by pressing X or A while equipped with the Mega Buster. Much like the X series and the later Mega Man titles, you can use ZL or ZR to scroll through your weapons, or you can tilt the right thumb stick to one of the 8 directions to automatically pick which boss’s weapon you want to use. The direction of the weapon is identical to the level select screen. You can also switch back to your mega buster by pressing both ZL and ZR together. This control scheme is so fluid and will make speed running this game very interesting to do and watch! And last but not least, the story of Mega Man 11 actually wasn’t bad! I mean, a story in a Mega Man game is pretty much an afterthought, but this one made sense and wasn’t the usual “I’m Wily, I made robots ‘cause… I’m Wily! Come fight me!” It supplied some backstory for Light and Wily’s relationship and even tied back up at the end. It’s not a mind blowing or gripping story, but for something they really didn’t need to do, it was enjoyable. Mega Man 11’s story gives a little insight on the rivalry between Dr. Light and Dr. Wily. I was not overly impressed with the music. I played with the default music for my first playthrough (there was a preorder bonus that offers an alternative soundtrack for some stages) and I made sure to play the game with the volume up as often as I could because it was a Mega Man game. I think we can all agree that Mega Man 8 has the worst soundtrack in the series. I would place this soundtrack above 8 on the list, but not higher than any of the other Mega Man games. The songs are decent, but none of them had that feeling that makes a song truly stand out. The first time I played Mega Man 9, Galaxy Man’s theme was stuck in my head for days. Sheep Man from Mega Man 10 always finds it’s way to the back of my mind when things fall silent. And maybe it’s because they’re new and they haven’t had a chance to grow on me. But my initial response after playing through the game only once is that the music was just okay. That would be fine for any other series, but this is Mega Man! “Okay” isn’t good enough. The voice acting for cutscenes isn’t bad. I actually enjoyed the voices! That is, until I started playing the game. All the extra grunts and screaming when you die got annoying fast. It didn’t take me long to adjust the audio settings to turn the music way up, the sound effects down, and the voices off. This actually gave me more of a classic Mega Man feel! As I mentioned before, the knockback from damage in this game is downright infuriating. Yes - there’s an item to lessen it, but I never bought it because I wanted to get through this game using minimal power-ups, like I do whenever I play Mega Man. It took way too long to figure out where Mega Man’s hit boxes were which made some mini-bosses more frustrating than they needed to be (I’m looking at you, mini boss from Block Man’s stage!). Some of the mini-bosses found in Mega Man 11. One last thing while I have you in the spoiler zone - Proto Man and Bass are no where to be found in Mega Man 11. I can kind of understand why Bass isn’t there. He probably would have felt shoe-horned in and out of place, but Proto Man being MIA is really weird. There was a perfect opportunity for him to pop in at the end and he just wasn’t there. I’m hoping we’ll get DLC in the future that has both as playable characters but to my knowledge that hasn’t been announced yet. Overall, my first impression is that Mega Man 11 is a solid entry to the series. I still have many play throughs ahead of me, so that might change. It’s still a Mega Man game though so it will beat you up a bit along the way. But just like every new Mega Man game, once you get into the groove of the new mechanics, you’ll find yourself rolling right on through. There are multiple difficulty levels if you are new to the series and want to ease your way in so it’s pretty accessible to anyone. Though if you are new to the series, the correct answer for where you should start is Mega Man 2. The good: Wonderful graphics, solid gameplay and mechanics, tight controls. The bad: Music was a little disappointing, sometimes levels felt too long. If you’re a Mega Man fan, I don’t think you’ll be disappointed in this title. 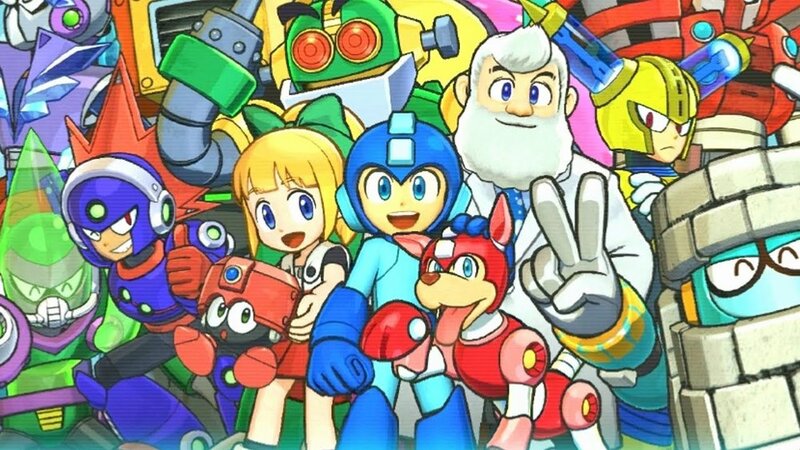 Talk with me about your thoughts on the game and anything else Mega Man related in our Discord or feel free to leave a comment right here.